In August 2011, I hosted a Google+ Hangout (see the video below) to understand how the food world was using the new service. Among those that joined the Hangout were Rob Spiro and Alon Salant, two successful entrepreneurs with a mission to start a tech company that supports local food. At the time, they were just beginning their journey – funded by investors from their previous ventures – and had no idea what they would build, but they knew they would call it Good Eggs. Over the next two years, they tested a number of models. For their first product, they built software that would allow food artisans to create an online storefront and sell directly to their customers. But they soon realized that to really fulfill their mission of growing and sustaining local food systems, they had to get into distribution. So, in February 2013, they launched an online marketplace for local food in San Francisco. They subsequently launched pilots in Los Angeles, New Orleans and Brooklyn, bringing on a total of 350 producers and growing their team to 80 employees. While Spiro has not disclosed how many weekly orders the company fulfills, it seems like he and Salant are happy with their proof of concept and are ready to expand. Yesterday, the company announced it has raised $8.5 million in Series A funding led by Sequoia Capital to grow its existing marketplaces and launch new cities in 2014. Harrison Metal, Baseline Ventures, Collaborative Fund, Kapor Capital and angel investors such as Max Ventilla are also participating in the investment round. This round put Good Eggs on somewhat equal financial footing with other local food delivery startups like Farmigo, Relay Foods and Greenling, which have each raised between $10 and $12 million to date, according to Crunchbase. Distribution logistics is one of the most challenging areas to tackle when it comes to local food. Unlike books or other durable goods, food is perishable, and it’s difficult to source from small producers. Traditionally, companies have addressed this by building out huge fulfillment centers where they warehouse goods and use hardware technology to automate the distribution process. 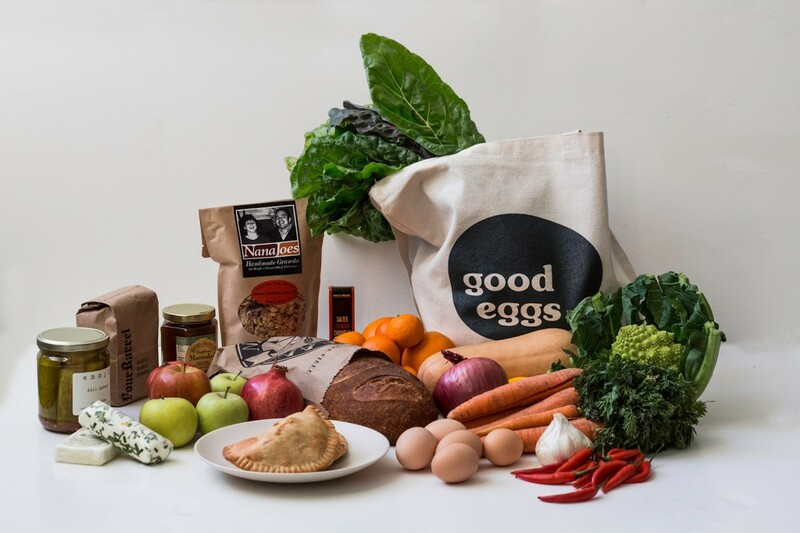 Good Eggs is taking a different approach by pre-selling all goods before they arrive at its warehouse and launching multiple smaller hubs in a given region, which reduces the inventory it manages. All of this is made possible through the software solutions it’s developing, which, Spiro says, is what makes the company’s model scaleable. “Because this is software technology, we have apps for our warehouse – we call them food hubs – that are telling folks what to pack and what things and how routes go out and it’s something we build once, and then we can deploy in a lot of different places,” Spiro explains to All Things D’s Kara Swisher. It’s still too early to tell which companies will emerge as the dominant local food delivery players, so I for one am curious to see what happens as Good Eggs scales its operations. You can learn more about Good Eggs’ model and plan for growth in my email interview with Spiro below. Danielle Gould: Since launching last year, Good Eggs’ model has evolved from simply a software platform to software and distribution. Why did you decide to get into fulfillment? Rob Spiro: Distribution is a part of the local food system that’s incredibly crucial and really lacking at the moment. As we talked to our community of producers and shoppers, we heard the same things again and again: the farmers and foodmakers needed help getting their goods to customers, and people wanted more ways to buy all their groceries from local producers. Better physical infrastructure was necessary for us to achieve our mission of growing and sustaining local food systems. DG: Distribution logistics are no walk in the park. How does Good Eggs’ currently get food from farm to customer? What makes your model scaleable? RS: The way Good Eggs works is that customers place their orders, which go right to the producers so they can start prepping. The day your order is ready, farmers harvest your veggies, the baker pulls your loaf of bread from the oven, and they bring it all to our Foodhub. We pack everything up and deliver it right to your door. We’re scalable because we’ve cut out the usual things that drive costs up. One of the reasons that’s possible is because we’re using lots of custom software throughout the process. Producers know exactly how much to harvest and make, which reduces waste. We’re not warehousing anything, all the food that shows up in our Foodhub is pre-sold, and goes out to shoppers that same day – that reduces overhead and makes for a really streamlined process. Plus, your groceries are a whole lot fresher when they’re prepped to order. DG: How is Good Eggs tackling the last mile? RS: We’ve got a fleet of delivery trucks to bring groceries right to peoples’ homes or offices. And our pickup spots are a real draw for folks – they swing by and grab their groceries, grab a sample of some seasonal fruit and chat with their regular Good Egg. DG: What’s the rationale behind launching pilots in Brooklyn, LA and New Orleans? Does Good Eggs make sense in cities that are sprawling and congested like LA? RS: All of our pilot cities are places where we’ve seen a big demand for more local food infrastructure. Brooklyn is a natural fit because of its thriving local food scene, New Orleans has a rich food culture and LA’s sprawl means that it’s actually a great fit for the kind of distributed Foodhubs we’re supporting. Our model is to create more, smaller efficient hubs to service their local communities, rather than one or two mega-warehouses trucking out food to millions of people. DG: It can be challenging for food tech startups to raise capital. Based on your fundraising experience, do you have any words of wisdom or lessons that you can share? RS: Do something that helps the farmers who are doing the right thing, and don’t quit.